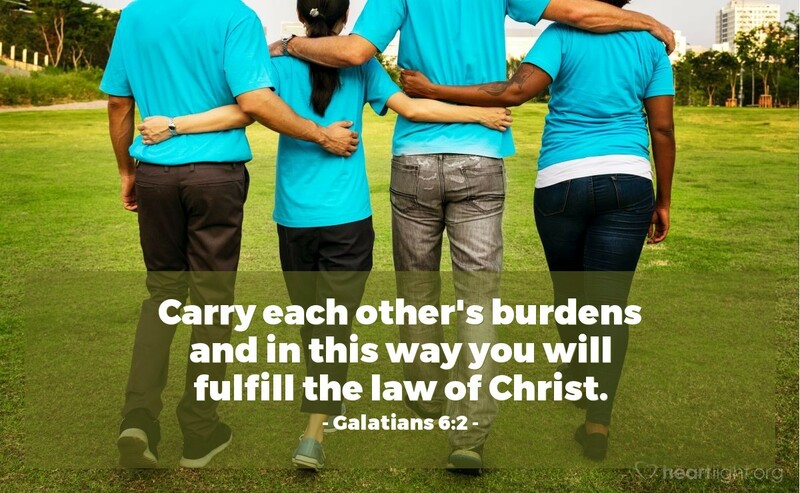 Carry each other's burdens and in this way you will fulfill the law of Christ. At times, I can feel so burdened myself that I can't even see the burdens of others. But Jesus reminds me that if I am to be like him, I will be a burden carrier. He became one of us to lift our heaviest burdens from our shoulder. The Lord died to free us from the weight of sin, death, and hell from our shoulders. Jesus has blessed us by carrying our heaviest burdens so that we might lighten the load of those around us. Compassionate Father, help me to see the burdens in the lives of others around me and then respond to those burdens with help. I want to be a blessing to the broken and discouraged, so please help me find my place and my way of serving to your glory. In Jesus' name. Amen.